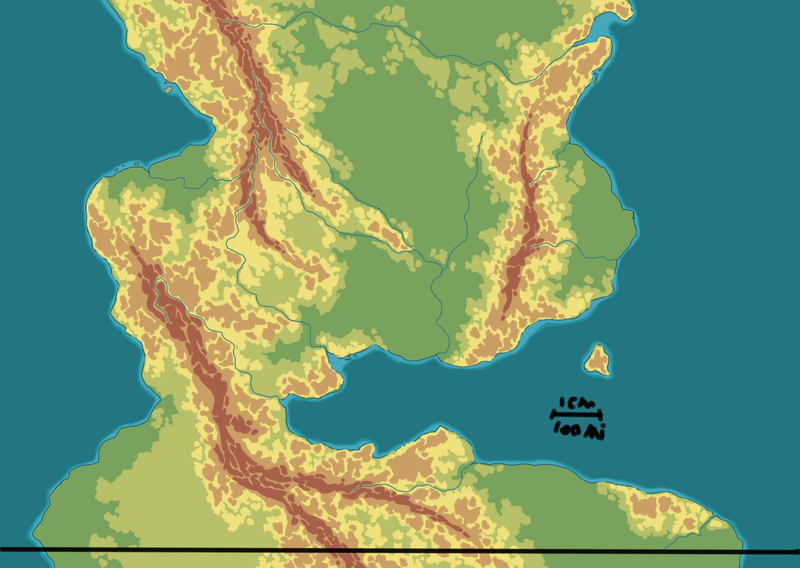 Is the following map fairly realistic? It is of a small continent, connected to a larger one, at a Europe like position on the globe. This is the continent in topographical map form, it also includes major rivers. There is a scale in the lower right (because of the format that isn't actually a centimeter) The large line at the bottom is this worlds 30th parallel or 30 degrees north. My next question will be concerning the climate of the map. and following that, the geopolitical boundaries. These rivers here look quite odd. Usually a river starts on a high end, like around the peak of some mountain, then flows to the sea carving a valley in the mountains. The rivers you have on the map starts already in a valley, and cut through the mountain range, not across. I would expect that they took the path going either to the East or to the West, rather than going South along the mountain range. First, mountains are the results of the clash of the crustal plates. Without seeing the larger world picture, what I see looks possible but not likely. That doesn't rule out this map. Earth is full of unlikely formations. @L.Dutch mentioned, rivers begin at mountains and very, very rarely cut through them. Water flows downhill. The steeper the incline the straighter the river. However, what caught my attention first was the central valley. that area would likely be dry planes or desert. The air loses its pressure as it rises up a mountain and can't hold as much moisture. Thus, it rains on the windward side of the mountain. The air on the leeward side is much dryer. If the area between the West and the East ranges was lower than the land to the north, you might have rivers feeding a lake/marsh area there but the water has to come from somewhere. If the winds were from East to West and the Eastern range is fairly short, you could probably get this effect but you would likely lose the green bit on the West coast where the two Western ranges meet. 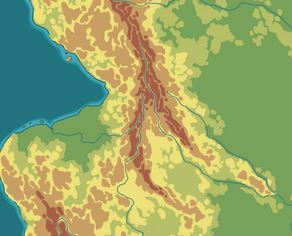 Lay out vegetation based on availability of water and soil. Soil is in flat spots and all over older mountains. Not the answer you're looking for? Browse other questions tagged reality-check geography or ask your own question.